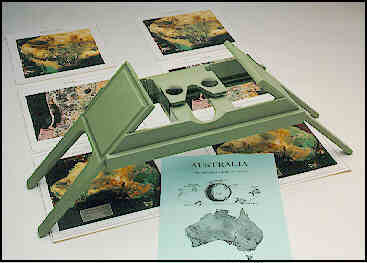 Australia from Space: Stereo Aids - Manufacturers of Mirror and Pocket Stereoscopes. Publishers of 3D Imagery. A stereo pair of the entire continent of Australia which can be viewed with the Geoscope. This is as close as one can come to seeing the whole surface of Australia in 3D at the same time. NOAA imagery is used. A stereo pair that stretches from the Pilbara to the edge of the Nullabor plain, so that the whole of the SW area can be viewed at the same time. NOAA imagery is used. A stereo pair showing the city of Bunbury, the coastal plain and the Darling Scarp. Higher resolution Landsat images are used. A 12 page booklet explaining satellite imagery accompanies the 3 sets of images. All images have a vertical exaggeration of 10X.